Details: Lab grade lipase enzyme powder comes in a 25g bottle. 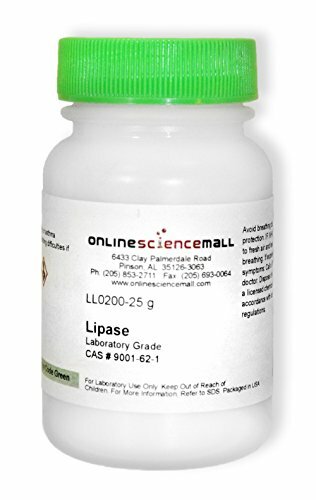 Lipase is an important enzyme in the digestive system that allows the body to absorb fat. It makes the perfect fit in any educational lab dealing with biochemistry. This is a high quality chemical product manufactured in the United States. This chemical is for laboratory use only, and is not for food, drug or cosmetic use. Keep out of reach of children. Each of our reagents come standard with an SDS sheet included and safe handling and storage procedures printed directly on the bottle. Heed all warnings on label.